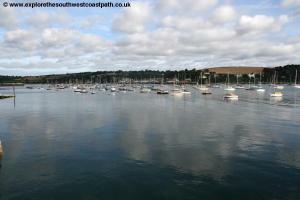 Unusually for the South West Coast Path, the first few miles of this walk are urban passing around the maritime town of Falmouth with its castle, beaches and harbour. 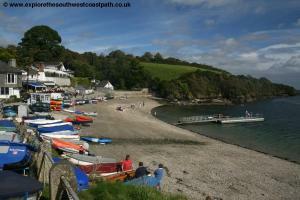 Later the walk becomes more rural heading out onto the Lizard Peninsula passing through the small villages of Maenporth, Mawnan and Durgan to end at Helford Passage on the north bank of the river Helford. Falmouth has good transport links. From the A30 trunk road take the A39 for Truro. 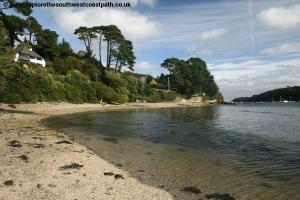 Continue on the A39 through Truro (follow the signs for Falmouth) and continue on the A39 which ends at Falmouth. From the A38 trunk road take the A390 through St Austell (which can be a traffic blackspot) to join the A39 on the edge of Truro where you turn left onto the A39 for Falmouth. Note that Truro and the A390/A39 junctions can all be a traffic blackspots. 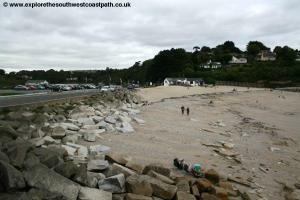 There are several long stay car parks in Falmouth, including the Dell car park near the station however the Church Street car park is the closest to the start of the walk although the Vernon Place and Town Quarry car parks are also fairly close. There is also both a 'park and float' service (essentially a park and ride except that the journey from the car park into the town centre is by boat) and a park and ride. The park and ride is a little cheaper than the town centre car parks. If you are coming by public transport, Falmouth is well connected. There are two trains per hour Monday – Saturday from Falmouth to Truro and a roughly hourly service on Sundays, operated by Great Western Railway. There are connections at Truro for mainline trains between Penzance and Plymouth via Liskeard, St Austell, Redruth, Camborne and Hayle with trains onwards from Plymouth to Exeter, Bristol, London and the Midlands. 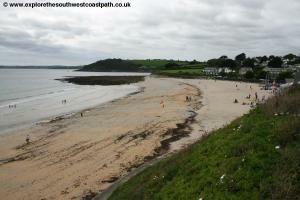 In addition there are regular buses to Falmouth from Truro, Penzance, Helston and Newquay. 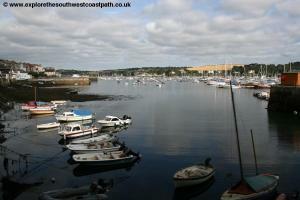 There is an excellent range of accommodation in Falmouth, being a large town. 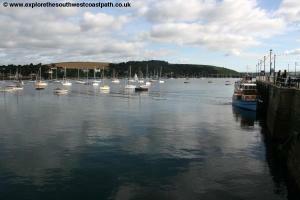 Visit Falmouth provides a comprehensive accommodation directory for Falmouth. 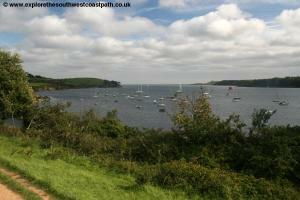 There is also a campsite, Menehay Farm Touring Park on the edge of Falmouth. 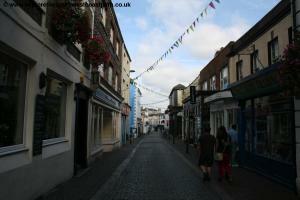 Falmouth is an interesting town which deserves some time to explore. The walk begins at The Price of Wales Pier. The pier is where the ferry service to St Mawes departs however there are numerous other boat trips offered including trips to Truro and Helford and a Mussel card is also available which includes travel on these ferries as well as local buses and trains. All the information about these transport links can be found from the information kiosk on the pier. 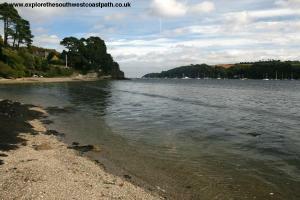 The pier also offers views over the beautiful Fal estuary which is a popular boating destination. From the pier head to the road, Market Strand and turn left. At the road junction ahead turn left to keep on Market Strand which now becomes (partly) pedestrianised. 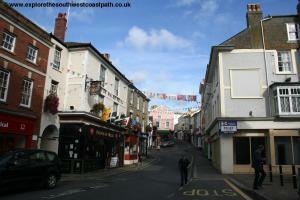 This pleasant cobbled street is the main shopping street in the town and has some attractive old buildings. Soon you pass a sign for the Church Street car park on the left. This leads down to the car park built on the water front which offers fine views of the Fal again, but this is not the route of the coast path and a dead-end so only worth a visit to see the view. Continue ahead as the road has now becomes Church Street which is still lined with shops which tend towards the independent shops rather than chain stores. 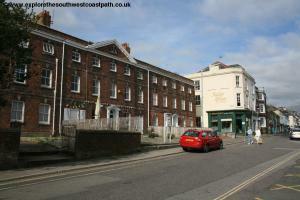 As you reach the church you turn left with the road which now becomes Awenack Street and is no longer pedestrianised. 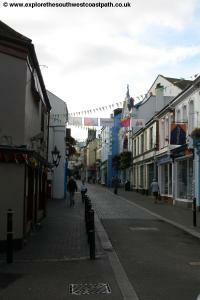 Ignore Quay Street on the left and continue straight on. Shortly after this the shops end and the street is now lined with houses and hotels on the right and a new residential complex on the left. 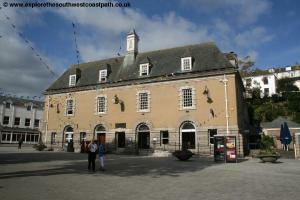 A new square has been built here with a large building at the back which houses the National Maritime Museum. Cross the access road into this area on the left and continue with a car park on your left. At the mini roundabout ahead keep straight on into Marine Crescent. At some point this becomes Bar Road and the pavement switches to the right hand side of the road only. Keep with this road as it turns to the right and goes under the railway bridge. Just after the bridge is a mini roundabout. Just to the left down Pendennis Rise is Falmouth Docks station, which is useful if you are arriving by train and don't wish to explore the town. Otherwise, continue straight ahead along Castle Hill. Keep with the road as it climbs and turns sharply to the left as the road becomes Pendennis Rise â€“ it's not hard to see how it got this name! 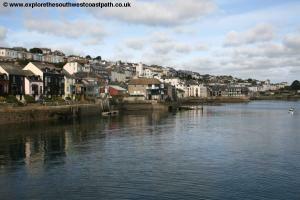 Soon the houses end and the road then opens up to offer views over the port of Falmouth. 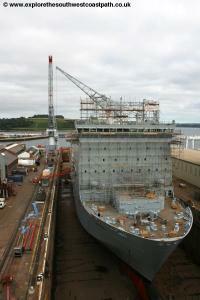 This is still very much a working dock with much industry visible below as well as ship building at Pendennis Shipyard. Just after the shipyard the road heads into woodland and look out for a part surfaced track off to the left. 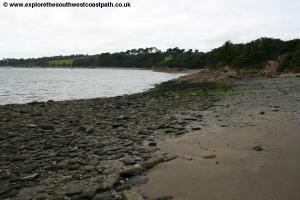 Take this track as the coast path briefly leaves the road here. 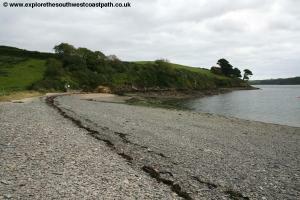 You continue on this wooded track, ignoring ways off to the left until you reach the far end of this little peninsula, Pendennis Point. Off to the right but out of view is Pendennis Castle, Pendennis Castle, one of two forts that guard the mouth of the Fal, the other being St Mawes Castle on the other side of the river. These two forts built on the orders of Henry VII to defend this strategically important river. 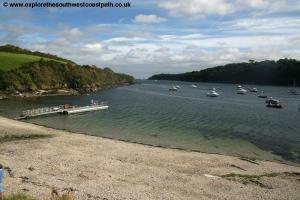 The path brings you out to the car park at Pendennis Point and from here you have wonderful views over the river and it's estuary and to Place and St Mawes across the river. To the south and west you can see the Lizard Peninsula ahead. The path now continues along the road on the western side of the peninsula, there is a pavement along the right hand side of this road (which is one-way here). There is a brief diversion from the road on a tarmac path on the left of the road, but this soon re-joins the road again. As you meet Cliff Road at the end of Pendennis Headland, continue straight ahead with the sea on your left along Cliff Road. 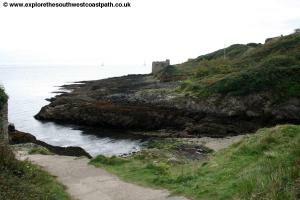 The coast path now continues along this road, Continue along the road with the rocky foreshore down to your left. 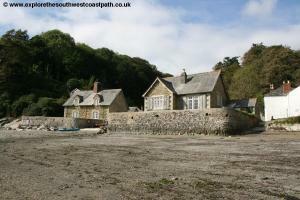 Soon you come to Gyllngvase Beach, a good sandy beach. 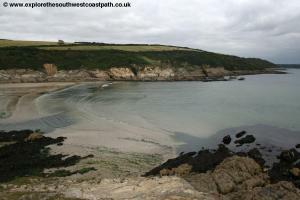 The coast path begins at the end of this beach, following the path around the edge of the low cliffs to nearby Swanpool beach another sandy beach with a small lake behind it, Swan Pool. At the back of this beach you rejoin the road climbing out of the beach and just after the restaurant on the left you fork left on the path adjacent to a private road. 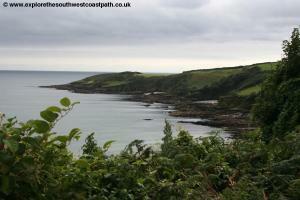 When the paths fork ahead keep left, closest to the coast to take the good path climbing out to Pennance Point. 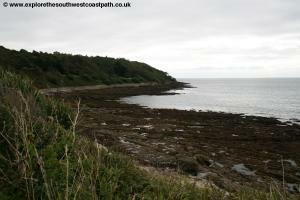 You then stick to the wide path beyond heading due west on the cliff top adjacent to a golf course. 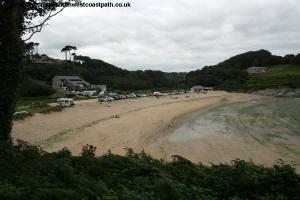 This continues alongside a couple of fields and then descends down to another good beach, Maenporth. You follow the road along the back of this beach and as it starts to climb take the path just to the left of the road which you follow out onto the cliffs (High Cliffs) above the beach. This continues on the path along the back of some gardens and then descends down to a track leading to Bream Cove on the left, a beach of rock and coarse sand. 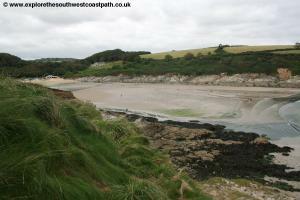 The coast path then climbs up from the beach and continues on the cliff top, along the edge of a field. Continue on the path through the bushes ahead and into another field. 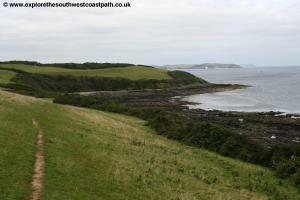 Here the path is a little back from the coast and crosses the field straight on ahead and into the next field where you re-join directly along the cliff top to reach the little headland of Rosemullion Head. 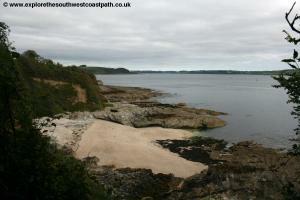 Once round this you stick to the obvious cliff top path along the back of Prisk Cove, a rocky beach. The path passes through trees just behind the village of Mawnan. Emerging from the trees continue on the cliff edge path as it turns to the right at Toll Point to head along the Helford river. 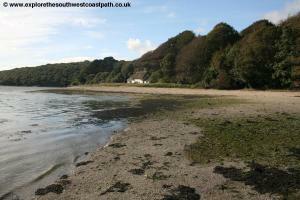 Pass Porthallack and Porth Saxon to pebble and sand beaches at the mouth of the river. 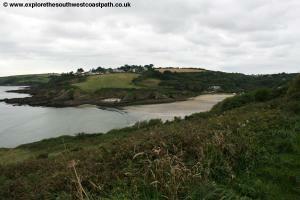 The path continues on the low cliff tops here and then becomes a track which emerges onto the minor road into Durgan. Keep ahead on the road here, alongside the coast down to the rocky beach. Follow the road out through this hamlet and then and as it starts to climb out and become a narrow track, turn left when signed onto the coast path, doubling back the way you came and back onto the cliff tops. 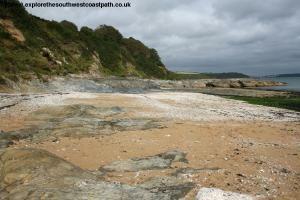 Follow this obvious path round to the next beach, Polgwidden Cove, another sand and shingle beach. 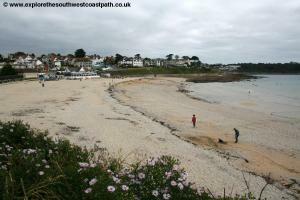 Keep to the main coast path, a wide track along the cliff edge after this beach. 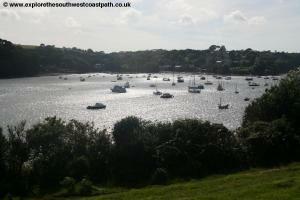 Very soon you turn off the track to the left to follow the path along the grassy area with fine views over to Helford and the river. 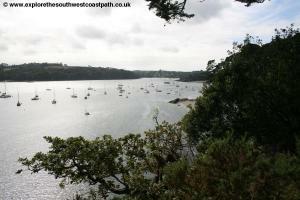 Soon you go over the stile and down to the waterfront of Helford Passage, where the walk ends. 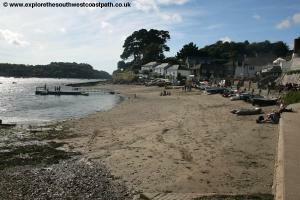 There is a pub here and during the summer months the ferry crosses to Helford on the other side of the river. To return to Falmouth head up to the road by the car park and follow this road uphill for a little under half a mile to reach the bus stop (the bus does not serve the village just the turning at the top). Once at the bus stop, by the junction of roads First Devon and Cornwall bus service 35 runs hourly back to Falmouth Monday – Saturday. On Sundays this bus runs 4 times a day. In addition service 500 also runs around 3 times a day, including on Sundays back to Falmouth.